Millions of people live with chronic and neuropathic pain, in large part because current treatments often provide limited pain relief, have a heavy profile of soporific side effects and can be extremely addictive. So researchers around the globe are chasing down potential new therapeutic agents and working to gain a better understanding of how molecules with painkiller activity function. This will lead to alternative painkillers - and possibly improve the quality of life for people who suffer from chronic pain. 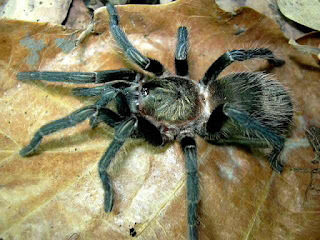 At the Biophysical Society's 60th Annual Meeting, being held in Los Angeles, Calif., Feb. 27 - March 2, 2016, a group of researchers from the University of Queensland in Brisbane, Australia, will describe their efforts with ProTx-II, a peptide toxin found within the venom of the Peruvian green velvet tarantula, Thrixopelma pruriens. Its high potency and selectivity to inhibit the pain sensation receptor make it an ideal candidate as a future painkiller. "Our group is specifically interested in understanding the mode of action of this toxin to gain information that can guide us in the design and optimization of novel pain therapeutics," said Sónia Troeira Henriques, senior research officer at the University of Queensland's Institute for Molecular Bioscience. How does ProTx-II work? "It binds to the pain receptor located within the membrane of neuronal cells, but the precise peptide-receptor binding site and the importance of the cell membrane in the inhibitory activity of ProTx-II is unknown," explained Henriques. So the group zeroed in on its structure-activity relationship by "exploring the structure, the membrane-binding properties, and the inhibitory activity of ProTx-II and a series of analogues," she added. Nuclear magnetic resonance (NMR) spectroscopy enables 3-D characterization of the structure of this peptide, which allows the group to explore whether it's important for its ability to inhibit the pain receptor. "Our results show that the cell membrane plays an important role in the ability of ProTx-II to inhibit the pain receptor. In particular, the neuronal cell membranes attract the peptide to the neurons, increase its concentration close to the pain receptors, and lock the peptide in the right orientation to maximize its interaction with the target," said Henriques. The group's work is the first to describe the importance of the membrane-binding properties of ProTx-II for its potency as an inhibitor of Nav 1.7, an important pain receptor. "Until now, studies characterizing the inhibitory activity of venom toxins have ignored the potential role of the cell membrane in their potency and activity," she noted. Beyond Nav 1.7, "other voltage-gated ion channels are located at the cell membrane and involved in a range of physiological processes such as muscle and nerve relaxation, regulation of blood pressure, and sensory transduction," Henriques pointed out. "Their 'faulty' activity is, however, associated with several disorders, so other ion channels are actively being pursued as drug targets for the treatment of neuromuscular disease, neurological disorders, and inflammatory and neuropathic pain." Based on the group's findings, they're now designing new toxins with greater affinity for the cell membrane and fewer side effects. "Our work creates an opportunity to explore the importance of the cell membrane in the activity of peptide toxins that target other voltage-gated ion channels involved in important disorders," said Henriques.